Newport-Mt. Olivet United Methodist Church presents the 2018 Newport Community Independence Day Picnic on Wednesday, July 4, 2018. 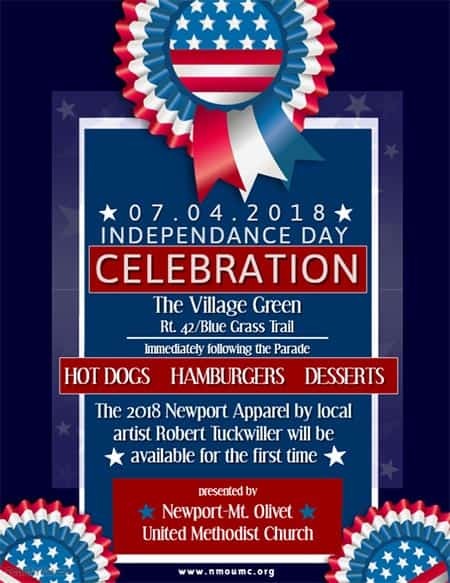 Immediately following the annual Newport Independence Day Parade that starts at 11:00 am, enjoy a Picnic on the Newport Village Green. Come and share freshly grilled hamburgers and hot dogs with all the fixings, along with salads, desserts, and ice-cold drinks. For more information, visit: our event page or our Facebook page or call 540-544-7183.